Darkspawn: Creatures of Helgedad – Giaks, Doomwolves, Zlanbeasts and more. Humans and Humanoids: Bandits, Assassins, Pirates and more. Natural Creatures: Lions, Tigers and Bears! Natural Sentient Creatures: Ogrons, Giants and more. Undead: Helgast, vordak, Skeletons and more. 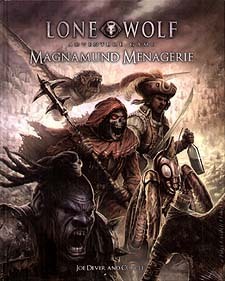 Making the Most of Your Monsters – advice for the Narrator on how to design and run effective encounters in the Lone Wolf Adventure Game. Appendix – Providing fascinating background details, detailing where monsters come from, and a timeline of their origins and more!